There are many different varieties of Indonesian curry. Each is special and unique!!!. One of those varieties is called "Gulai or Gule". 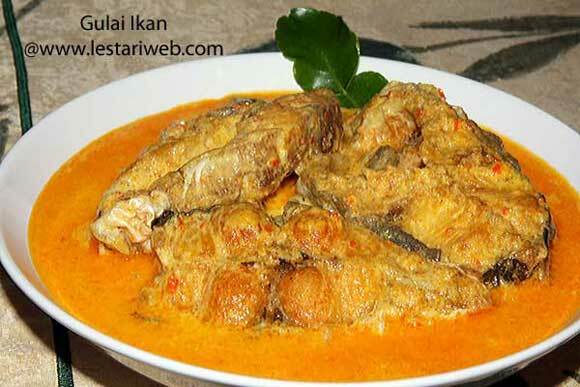 This dish is very popular in most part of Java and West Sumatra region. I've got this recipe from my grandmother, one who's spent almost her private, social and profesional life in the kitchen ;-). Personally I would say "Gulai" is considered to be a ligt or a mild curry, compared to it's heavy sort of currys which usually contain some distinctive curry spices such as : cinnamon, clove, cumin and cardamom. However it doesn't mean that this recipe lack of curry's taste and flavour. In contrary if you are a kind of Curry's fans but do not like a strong aromatic smell of the above mentioned spices, then I will recommend you to try this once. If preferred, you can also use meat or chicken instead of fish. Put the fish in a bowl and mix with salt and lime or lemon juice. Heat 50 ml oil in a frying pan, fry the fish until golden brown. Set aside to drain. Heat 2 tbsp used oil in a another frying pan, stir-fry the paste all the time until fragrant. (Don't add oil if already added in a blender during the blending process). Add lemon grass, galangale, kaffir-lime leaves. Stir to mix. Transfer the paste to a large saucepan. 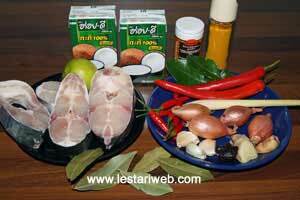 Add the fish, tamarind water and bay leaves. Pour in the coconut milk, bring to boil then reduce the heat to simmer and stir often for 15 minutes. will this dish only work on white flesh fish for optimal taste?